power_settings_new Shutdown7 - Shutdown smarter! With this application you can do more than just shutting down your computer. Shutdown7 offers you with an compact, but feature-rich user interface many ways to automate shutting down your computer. With the compact but feature-rich interface you can automate everything around turning off your computer in a straightforward way. Control your computer over the internet. 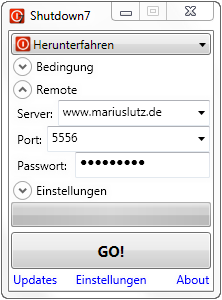 Easily send your computer commands from a different computer, the web or from your smartphone. Of course password-protected. Select your favorite music which is played while you are falling asleep. Moreover, schedule waking up your machine to awake to your favorite radio station and today's news. Send your computer to sleep in only two clicks using the Jumplist. Never lose track of the current countdown as it is displayed in the taskbar or systray. The android help turns your smartphone into a remote. You can control and send your computer to sleep from anywhere. First, choose the appropriate action. Besides the usual power actions including shutdown and restart you can choose to launch a program. Then, choose a condition which must be fulfilled to execute the action. You can choose from a plethora of possibilities, including a simple countdown, waiting for a process to close or a file to be deleted. Finally, start the process and lean back. Shutdown7 is not a resource-intensive suite with a crammed user interface, but has a tidy user interface in which all important functions are integrated in a compact way. The CPU- and memory-footprint is low, so it can run in background without issues. On the first run an assistant leads you through the set up and notifies you about the newest changes. The integrated updater notifies you when a new version is available and automatically downloads it for you. The number 7 stands for the broad support of APIs that were introduced in Windows 7, which integrates Shutdown7 into your personal work environment. 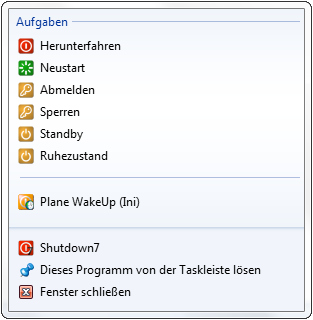 Shutdown7 embraces many aspects of the superbar (former taskbar). Using the jumplist you can start send your computer to sleep in mere two clicks, without having to launch Shutdown7. The taskbar icon indicates the countdown progress so you can observe the status without having to leave your current work. If you wish, you can activate the systray icon which allows Shutdown7 to hide in the notification bar until it is needed. You can control your computer on the move, as well - from a computer, the web or even your smartphone. Just schedule a countdown, observe the current status or abort the current action. Do you know that feeling? 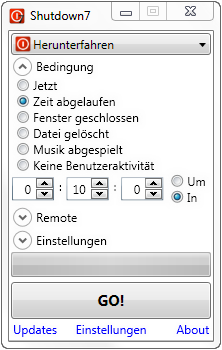 You want to play some music until you fall asleep, but the computer should not run the whole night? No problem anymore. Just select your favorite tunes or an audio book and Shutdown7 plays them for you. 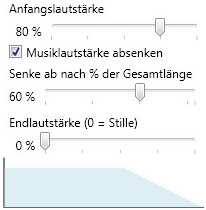 Your computer will turn off when all music files were played. Additionally you can enable to fade out the music volume and turn off your screen. Are you not a morning person? Is your buzzing alarm annoying? No problem, either. In combination with the software WOSB from Dennis Babkin Shutdown7 allows to wake your computer up the next morning and opens your music player, the radio station on the internet or a newsreader to help you kick-start your day. I am an university student working on this project part-time. Any amount would help support and continue development on this project and is greatly appreciated.